For many chefs, the jump into the culinary profession comes as a second career - often by accident. But Chef Andrew Adams sawchef whites in his future from at least age 8, when he told his dad on video that he was going to be a chef when he grew up. 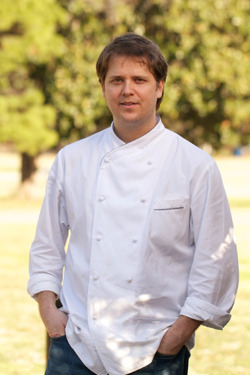 Andrew started as an apprentice at the nationally renowned KC’s restaurant in Cleveland, Miss. at the age of 16. After working three years with Wally Joe, he left to attend the prestigious Culinary Institute of America (CIA). After graduation, Andrew worked with Chef Jamie Shannon at the venerable Commander’s Palace in New Orleans then took a position with Chef Craig Shelton at The Ryland Inn, a Relais & Chateaux property in Whitehouse, NJ. After working with Chef Shelton for a year, Andrew returned home to help Wally open his eponymous restaurant in 2002 as Chef de Cuisine.